Interview with Donna Earnhardt, and book giveaway! Today I am happy to introduce Donna Earnhardt to my cozy interviewee chair. 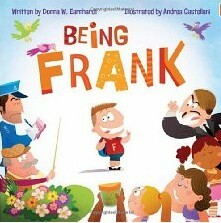 🙂 Please read my March 12 review of her first picture book – Being Frank. Donna lives in North Carolina, USA, is happily married and has three daughters. She loves to sing, play guitar, write stories and songs. Donna, I’m pleased to welcome you to my interview corner as a new picture book author. 🙂 Please sit back, relax and tell us a little about yourself. And I’m glad you could make it. 🙂 When did you first know you wanted to be a writer? Who or what inspired you? I have always loved to write. My mom still has a poem I wrote for her when I was 5 or 6. I had dreams here and there about being published, but they were just dreams. I didn’t do anything about them because I didn’t really see them as viable. But after my first daughter was born, I decided to pursue publication. My family stood behind me 100% with encouragement and prayers… and even gave me a new briefcase full of writing supplies. They then told me to get busy! I love them! That is so wonderful! As a writer, do you do much reading? Who were/are your favourite authors or books? I love to read and read all the time as a kid, all the way through college. But now, unfortunately, I do not make as much time for reading as I would like to. I have a lot going on in my life and sometimes reading falls into the “things I need to do but can’t do right now” abyss. When I do read, however, I try to read some of my fave authors (C.S. Lewis’ works included) as well as newer authors. I have, in the past two years, really delved into picture books and will check out as many as 40 from the library at once. I enjoy reading them, but I also study them. I also like to read “how-to” books on the craft of writing. I’m learning a lot! There is so much to learn. Have you ever felt like giving up? Giving up? Yes. Many times. Especially in the times of waiting or when I’ve received an inbox full of rejections. And when those times come, I usually end up complaining to God about it all. And I can honestly say that He always sends encouragement right when I need it! Someone will write, call or send me a note to tell me how much they are enjoying something I’ve written, or are looking forward to seeing me at an upcoming writer’s conference. I then feel that surge of hope and get back to work! Encouragement is so important, isn’t it? Do you have a motto or Bible verse or quote that you try to live by and that helps to keep you going? Oooooh… that’s a good one! I do have a favorite verse that applies to the writing side of my life. I want my tongue, my pen, my verse… all to be stirred and filled by the power of the Holy Spirit. I want my writing to bring honor to God’s kingdom. I want my writing to be an instrument of peace, joy and love – regardless of what I am writing. It might be a mystery, a romance or a children’s book – but I want it all to be good stuff. Not just words on a page. Ya know? Yes, I do know what you mean. 🙂 What do you remember about your very first time to be published, how did that happen? Honestly, I can’t remember if I sold a poem to WeeOnes Magazine first – or to Blue Mountain Arts (greeting card). I need to go back and read my journals and other interviews! EEP! Either way, I know this… I was thrilled. I was actually going to get a paycheck! Wait… I think it was Wee Ones! Yes, the poem, SPLASH! It was a free verse poem and WeeOnes didn’t pay very much (it was a small online mag), but it made me happy to be able to say I got a check for my work! That would be encouragement to keep writing. What have you had published thus far? Of those, what do you most enjoy writing? What I’ve had published so far: magazine articles, puzzles and poetry (adult and kid mags), a picture book (yay! ), greeting card/novelty market stuffs. I honestly don’t know that I have a favorite. I like them all. Diving in to all the different genres keeps me on my toes and doesn’t allow me to get bored with any of them! You have a very busy mind! What process do you go through when writing and perfecting a book or article? Ooooh… I don’t know that I have a certain process. I am not a very organized person. I tend to rewrite something as I’m writing it from scratch. Therefore, when I finally get to the end… I’ve already revised many times over! I do, however, almost always utilize one of the best resources in a writer’s back pocket… my critique partners! If at all possible, I write them down as soon as they pop in my head. And if it is important enough to write down the idea, then I usually go ahead and try to get some of the story on paper. That’s pretty much it. I have been known to send myself a text or email with ideas that pop up during the day. I’ve called myself and left a message; whatever works! 🙂 What inspired you to write Being Frank? How long did it take you to write Being Frank? What inspired you to write it? And how did you come up with that clever play on words for the title? Let’s see… it only took a couple of days to get the first draft (with my revisions) finished. Then a few more days to revise based on feedback from my crit group. Then another year and half of revisions with my editor. Mostly little stuff, but some were major overhauls of characters’ names, settings and conflict. As for the title: I was praying and that title popped in my head. My dad’s first name was Frank. He was on my mind when I was praying. He was killed in a car accident about 10 years ago. So it is nice to have this book bear his name! I am definitely thankful for answered prayer about the book! And I am really glad the publisher liked the title, too. I was (and still am) attached to it! I’m sorry about your dad, Donna. I’m sure he would be so very proud of his author daughter. 🙂 Now I have to ask, are you anything like Frank or any of the other characters? Yes. And yes. 🙂 Actually, my hubby and kids… and most everyone I know… can find a little piece of themselves in Frank. It’s hard for me not to say everything I’m thinking. And that can get me in trouble! I am a lot like Carol, too. A bit on the sassy side! And my breath is probably much like Ms. Zaroma’s many days. I’m thankful for mints! How did you go about finding a publisher? an editor? and do you have an agent? A friend suggested I sub to Flashlight Press. The whole process was not as horrible as it could have been because Shari Greenspan is a FANTASTIC editor. Flashlight Press is a small press… but they believe in the books they choose to publish. And they support them with gusto! Maybe for your next one. 🙂 We’ve already established your family has been very supportive of you. What kind of reaction did you get from them when you found out Being Frank had been accepted for publishing? Yum! As a key person in Write2Ignite, what can you tell us about that and how it has helped you in your own writing goals? Oh wow. Write2ignite has helped me re-evaluate how I see myself and the calling of God on my life as an author. I am only one of many on the staff of Write2Ignite. We work hard hours during the year and look forward to this conference every time it rolls around! Maybe someday things will come together for me to participate in one. How do you find time to write when you are busy with life? I catch an hour or two here and there… when I can! There is no rhyme or reason to it right now. But I want to move to more official “office hours” this year. I believe they will help me see how much time I am actually wasting that I could be writing! Fishing, hiking and going on adventures with my family. I also love to watch Doctor Who with my kiddos. Oooooh – and playing the pc Nancy Drew games and wii with my girls. Yeah, I’m an overgrown kid in many ways! Honestly, I wish I did have consistent writing goals. I try – but don’t reach my goal very often. There are days that I write 2,000 or more words… then days with 0 words. It’s hit and miss much of the time. I wish I could say it wasn’t that way, but I’d be lying if I did. I think we all have to write when we can – and do the best with the time we have. I hope to be more consistent and productive and am putting forth a better effort in that area. But I don’t beat myself up about not being an everyday writer. I am thankful for grace! I have 4 other picture books, two chapter books and some poetry for kids. I’m also working on a sweet, clean romance novel. I am really excited about that project! I also have a murder mystery that I’ve been working on for about 11 years now! I have my picture books in some agents’ email boxes. I hope one of them will love my work and take me on! Wow! You are a prolific writer! I wish you much success. Finally, do you have any advice for hopefuls? Don’t take every critique as a personal attack on your writing skills. Don’t take every critique as the absolute, only direction for your manuscript. Don’t forget to stop writing long enough to go out and enjoy LIFE. Don’t whine too long after receiving a rejection. Don’t be jealous of other writers’ successes. Your day will come. Don’t belittle other writers. Build them up. Don’t write a 4,000 word picture – like I did. And please don’t call the editors you want to send it to and ask if they want to see it. Seriously. They don’t seem to like that. Don’t hide away your stories with your underwear and socks. It needs to be read. Not hidden away like some “prisoner of drawer”. Wow! What great advice. (prisoner of drawer? funny! 🙂 ) Thank you, Donna for a fun interview and a peak into your creative life. I love that the Holy Spirit was mentioned in the interview. I was also touched that the book’s title has her Dad’s name. I loved this interview and the opportunity to learn more about Donna. What an inspirational and encouraging journey she had in wiring Being Frank. It was good to learn that the book’s MC bears the name of her father. Great interview with Donna, whose vibrant wit and wisdom shine through all that she does! I love that her family encouraged her with a briefcase full of supplies. Great interview! I look forward to reading the mystery novel when it is completed. Hopefully not another 11 years 🙂 It is also nice to hear someone speak freely about how God works in her life. I wish you every success Donna. Nice interview! Donna has a cute book in BEING FRANK. Thank you all so much for all the encouraging words! And huge thanks and virtual hugs to Lynn for being such a generous blogger!! P.s. if you win the copy of being Frank… I hope it makes you giggle!! And if you want a signed bookplate for it, just let me know! Great interview. Best advice – “Don’t stop learning” I was touched that the main character was named after the author’s father. Sounds like a wonderful picture book. What a nice tribute to your father! There’s a lot of encouragement in this post. I’d love to win a copy of Being Frank. I loved the interview! What an encouraging story! I also homeschool my children. My daughter is 10 and loves to write “books”. What a great idea to send a story or poem into a magazine like you did with Wee Ones! She would love that!! I also liked the reference to her dad. I’m so glad her dad’s name was able to be used for the book. I can’t wait to see her other works! Enjoyed reading this interview! I love her Bible verse and her advice. My 15 year old son loves to write. I am eager to share Donna’s words of wisdom with him. Looking forward to reading her book! Hi Sarah! Looking forward to seeing you in April! And big thanks to everyone for all your encouragement. I am still in happy shock about the publication of Being Frank and I appreciate all your enthusiasm for it more than you know! Enjoy life! Don’t whine and encourage others! And when you are BEING FRANK use more salt and a lot less pepper! In my previous comment I did not SHARE.